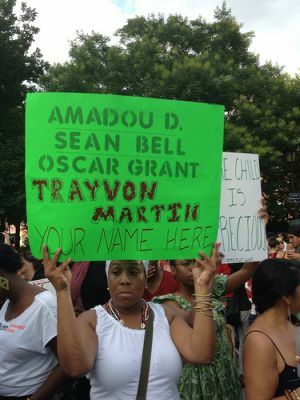 WASHINGTON, Jul 15 2013 (IPS) - Nationwide protests, marches and petitions have erupted in the days following the acquittal of George Zimmerman, the focus of a widely watched murder trial over possible racial profiling, late on Saturday evening. Zimmerman, a 29-year-old Hispanic man and volunteer neighbourhood watchman, shot and killed a black youth named Trayvon Martin on Feb. 26, allegedly in self-defence. Zimmerman was subsequently charged with Martin’s murder. Over the past five weeks, the trial has transfixed much of the U.S. television-viewing public, as commentators have explored what the incident has to say about race relations in the United States today. After deliberating for more than 15 hours, the jury found Zimmerman not guilty, largely due to a controversial state law known as Stand Your Ground, which authorises the use of “deadly force” if someone is being threatened. Following the court decision, crowds reportedly gathered in a Los Angeles park and chanted “Trayvon Martin”, while police officers looked on. In Chicago, hundreds more rallied downtown, chanting “No justice, no peace” and “Justice for Trayvon”. “People have been speaking up and speaking out against this culture of violence and calling for people to be held accountable,” Lisa Graves, executive director of the Center for Media and Democracy, an investigative reporting organisation, told IPS. Protests of up to several thousand demonstrators also took place in New York City and Boston, among other places. “It’s outrageous that we have a situation in which a young man like Trayvon can’t walk home without the fear of being accosted by some police wanna-be who is armed and dangerous,” Graves told IPS. A former advisor to President Barack Obama, Van Jones, tweeted an image showing civil rights leader Martin Luther King Jr. wearing a gray hooded sweatshirt similar to the one Martin was wearing the night he was shot. Along with the photo, Jones posted the words “April 4th, 1968 #RipTrayvon Martin”, the date King was shot; the image went viral and was re-tweeted by thousands. Signed into law in 2005 by then-Florida governor Jeb Bush, the Stand Your Ground legislation allows people to use deadly force to prevent bodily harm or death. The rate of so-called justifiable homicides in Florida tripled after 2005, and now 24 other states also have similar laws on the books. Yet Saturday’s jury decision does not appear to be the end of the matter for Zimmerman or advocates on either side of the issue. The Center for Media and Democracy launched a petition on Monday asking the Department of Justice to file civil rights charges against Zimmerman, and Attorney General Eric Holder has vowed to pursue a federal investigation into the shooting, using evidence provided at the trial. Members of the Congressional Black Caucus and the Congressional Hispanic Caucus have been particularly vocal about their support for the federal prosecution of Zimmerman. “I am disappointed in the jury’s verdict, and heartbroken for the scores of young black men nationwide for whom this verdict delivers a startling message: Our fight for civil rights is far from over,” said Representative Elijah E. Cummings of Maryland, and a senior member of the CBC. In order to convict Zimmerman of any civil rights violations or hate crimes, the government has to prove to a jury that his actions against Martin were racially motivated. Though Martin’s friends and family say Zimmerman has a history as a racial profiler, Zimmerman’s lawyer says there is no evidence. According to Graves, civil rights charges are not the only legal option for the Martin family to take. The family could also pursue a civil case, where the burden of proof is less difficult than at a criminal trial. “Often times, people do have success pursuing a civil case in the face of not prevailing in a criminal case,” Graves told IPS. Yet Graves cautioned against pursing a civil case due to the Stand Your Ground law, which states that if the defendant is granted immunity and a win in court, the prosecution is required to pay their legal fees and losses. Zimmerman did not seek immunity in the criminal trial. Despite losing in court, an attorney for Martin’s parents said the experience will have a lasting impact on the United States, and compared Martin to Emmett Till, a black boy who was murdered in Mississippi after allegedly flirting with a white woman. Till became one of the more prominent martyrs of the Civil Rights Movement. “Whenever there is injustice like this and someone loses their life, and there is a feeling or fear that it was based in part because of race, those types of parallels are quite natural,” Graves says. She adds that such tragedies will happen again, due to the type of “vigilante culture” that laws such as the Stand Your Ground law have created. According to Dilahunt, the way to prevent future tragedies is to change the mindset of the country.